Posted by Vivian on 18 December 2008; This entry is filed under General. Most kids are bundles of energy and they need to need to work that off. Kids also need exercise for their personal development and good health. So there needs to be someone who can provide kids with suitable exercise and related activities in a sensible and safely managed way. 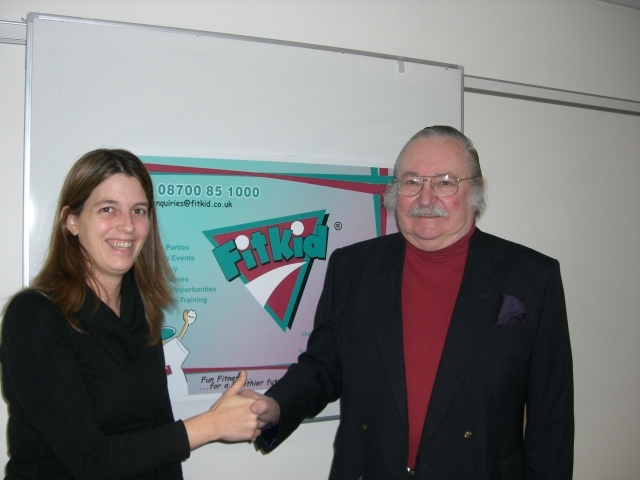 FitKid started 18 years ago to meet those needs and became a very successful children’s activity business catering for children from 18 months to 16 years of age. Run by Nicky Kay since 2001 and based in Poole she has taken it from strength to strength running parties, classes and events as part of a school curriculum or with other groups in various sites. But Nicky can only do so much. So how can the business grow? The business model was proven over the years. The financial plan was sensible. Nicky’s solution? Franchise FitKid across the UK. With a well founded reputation, any Franchisee would feel secure. The proposition would be attractive to women. A child-centred business that can be run at times to fit into a woman’s needs and bring in extra money would be a good idea especially when money is tight. Convincing people to sign up for a Franchise with up-front costs for training, materials and a licence was a new challenge. Trying to win Franchisees was a real struggle. Nicky sought help from DorMen and was matched with Joe Windsor as her Mentor. The need was clear. How do you sell a great business idea with a sound track record to potential Franchisees? DorMen Mentors have a wide range of knowledge and skills available to their Clients. Joe’s skills in marketing and selling were just what Nicky needed. An intensive development session about how to sell the Franchise coupled with joint work identifying FitKid values and creating new promotional material gave Nicky the understanding and the tools to influence potential Franchisees. She promptly signed up four in a fortnight. Nicky then needed to run a training course for them and asked for support in training new people how to make presentations to potential users – parents, teachers, church groups. Joe shared his PowerPoint materials with her and coached her through the key issues. Nicky said “Joe has been a great inspiration to me. I needed the confidence to sell the franchise package and Joe gave me just that. It’s great to have a Mentor as they are there as a sounding board to offer support and suggestions to move the business forward”. Joe says Nicky is a very responsive business person and a pleasure to work with. FitKid – another shared success.